As this wonderful picture (courtesy of my good friend Mary Spain) shows, the bluebell woods are blossoming at the moment which, hopefully, means that summer is just around the corner. The approaching May Day holiday is of course an affirmation of that - according to tradition, the celebration of May Day is to mark the beginning of summer. Believed to have originated in Roman times when there was a festival of Flora (Roman goddess of flowers & fruit), May Day affords us all the opportunity of appreciating the wonderful world around us. Flowers - venture out into the countryside if you can with family or friends. 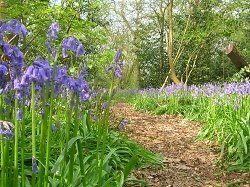 Find a bluebell wood perhaps or visit a special country garden open to the public. Fruit - after your refreshing day out in the country, return home to makesome delicious homemade ice cream. Try one of my top 10 ice cream recipes such as Butter Pecan Ice Cream. Whatever you do over this holiday weekend, if possible take a little time to relax and appreciate the world around you and the people closest to you. After all, that what celebrations are for!